The old entries will remain intact for references.. Traded in, a pair Sophia Electric 300B's with carbon anode. Very unusual as the 300B originally never was produced with a carbon anode. You might even have some scepsis about the use of carbon at pseudo low high-voltage. Word is that the barium oxyde heater in a 300B does not get hot enough to prevent it from being polluted by carbon evaporation, that is why thoriated tungsten was used (source: JacMusic). It is a fact that in the early years never a 300B with carbon anode has been produced, but there were rectifiers with carbon anode and barium oxyde heaters like the 1616.. A shortened lifetime is said to be expected because of the use of carbon. I guess time will tell. As you can see this is a very good looking 300B with luxury lettering, big ST-shaped thick glass and porcelain base. When the filament is lit, you can hear a tingling noise for about 10 seconds, most likely to be caused by expansian. When the high voltage is applied it takes some time for the glass envelope to get hot. I put the 300B's at 370 Volt at 60 mA using fixed bias of about -74 Volts resulting in 8 Watts power output. It is driven by a 5842 which is interstage coupled to the 300B. Regular readers might notice that this is the type 50 amplifier, which is correct. Well, to be honest, I was pleasantly surprised. It takes some time to heat up, about 20 minutes, but then the Sophia Electric kicks in with firm bass and spacious sound. Compared to the '50 (old stock) it has more slam/dunk and compared to the EML 50 it is a tad more romantic (which I happen to like). Highs are clear and refined, mid is where the 300B got it's fame. 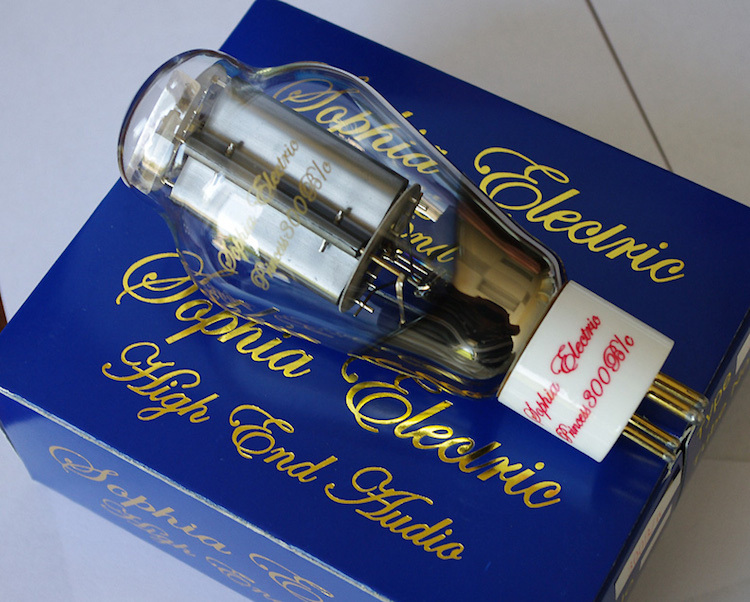 The FullMusic 300B/n can not compete with this 300B/c in my amplifier.. and the Western Electric, well, remains the Western Electric as this is the Old School top performer that has some kind of magic that is not present in any 300B replica. But hey, these cost a fortune now-a-days..
And about the lifetime of the 300B/c, we will have to use it and see..
Discount on Valves for Sale! During October 2014 a whopping 25 percent discount on all Valves for sale (excl P&P). Visit http://www.dhtrob.com/buisvoorraad to see the stock..